During the Eocene epoch, Antarctica featured high concentrations of atmospheric CO2 and a subsequent greenhouse climate. By using a new measuring technique, scientists from Yale University have now learned that Antarctic seawaters were once as warm as as those registered in Florida and California today. Top image: Antarctic-Australasian dinosaurs of the Cretaceous, a warm era that preceded the Eocene. Credit: John Sibbick (used with permission). Today, Antarctica is consistently one of the coldest places on Earth, featuring annual average land temperatures far below zero degrees Fahrenheit. But it wasn't always that way. 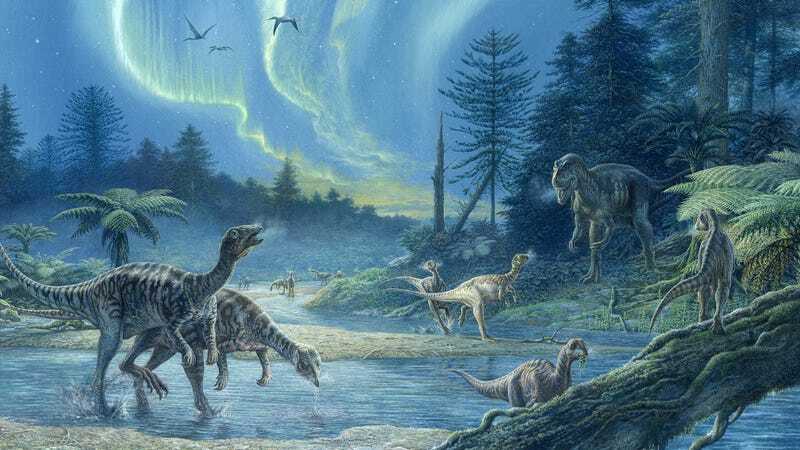 Fossilized evidence — including the remains of mighty sauropods — show that plants and animals inhabited the region many millions of years ago. The continent remained warm even after the extinction of the dinosaurs, an era known as the Eocene (40-50 million years ago). And remarkably, forests were still there as early as 12 million years ago. Looking to learn more about the climate during the Eocene era (about 15 million years after the dinosaurs went extinct), Yale geoscientists Hagit Affek, Peter Douglas, Mark Pagani, and colleagues used a new technique called carbonate clumped isotope thermometry to get a better sense of what Antarctic temperatures were like back then. The scientists measured concentrations of rare isotopes found in ancient fossil shells taken from East Tasman Plateau and Seymour Island, near the Antarctic Peninsula. Specifically, they measured the abundance of two isotopes bound to each other in fossil bivalve shells. The precise concentration of bonds between carbon-13 and oxygen-18 can tell the researchers the temperature in which the shells grew. Their analysis showed that temperatures in parts of Antarctica reached as high as 17 degrees Celsius (63F) during the Eocene, and an average of 14 degrees C (57F). This is similar to the average annual temperature off the coast of California today. In the southern Pacific Ocean areas, water temperature reached about 22 degrees C (72F), similar to seawater temperatures near Florida today. These same waters now experience an annual average temperature of about 0 degrees C.
But because these ancient ocean temperatures were not evenly distributed throughout the Antarctic ocean (they were higher in the south Pacific side), the researchers say it likely had to do with the effect of ocean currents. Disturbingly, these findings show that the Earth's poles are more vulnerable to climate change than we thought. "By measuring past temperatures in different parts of Antarctica, this study gives us a clearer perspective of just how warm Antarctica was when the Earth's atmosphere contained much more CO2 than it does today," noted Douglas in a statement. "We now know that it was warm across the continent, but also that some parts were considerably warmer than others. This provides strong evidence that global warming is especially pronounced close to the Earth's poles. Warming in these regions has significant consequences for climate well beyond the high latitudes due to ocean circulation and melting of polar ice that leads to sea level rise." Indeed, the simulations showed that oceanic heat transport in the South Pacific was largely responsible for the observed spike in temperature. Read the entire study at PNAS: "Pronounced zonal heterogeneity in Eocene southern high-latitude sea surface temperatures." Supplemental information via Yale University.